Another month, another Snapchat feature blatantly ripped-off by Instagram. This time it's arguably the biggest feature of Snapchat, the all-too popular face filters. In the latest 10.21 update for both iOS and Android, users will now be able to tap a button and enable the face filters mode. Here they can select from a small bunch of filters at the bottom that update and animate in real-time. 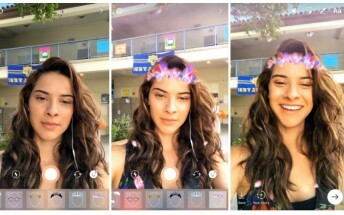 Not only has Instagram completely copied the implementation of the feature from Snapchat, it has also copied the actual filters, many of which look nearly identical to those on Snapchat. They also have the same little features, such as opening your mouth for additional effects and animations. You can either record a video with these or take a picture, which can then be uploaded to your story or sent directly to an individual user or a group. Another "new" feature in this update is Rewind, where a video once captured plays in the reverse order. This has also been ripped-off from Snapchat that has had this feature for a long time now. Other additions include adding hashtags to your story photos and an eraser brush. By now Instagram has copied nearly every feature of Snapchat, rendering the latter fairly pointless for a lot of people who undoubtedly would have more friends on Instagram and would no longer see any need to keep having Snapchat around. And while one would argue it is just business for one company to oust its rival, Instagram did this not on its own strength but by piece by piece ripping-off the very competitor it wanted to replace. If you can get behind that business strategy that's your call and it may not be enough for many of us to stop using it but it at least justifies one measly little rant every month, just so if anybody at Instagram is reading they'd know people aren't oblivious to what they are doing.